Home > Blog > News > What exercise is right for you? We are all aware in today’s society that exercise is important. The need to be fit and healthy and remembering that “your body is your temple”. We know these things but what are we actually doing about it? What exercise is the right one for you? There are many ways to exercise and develop a healthier body and to motivate yourself to be active. Getting the right combination of factors is for me the key to having fun whilst keeping fit. This could be going for a walk with your dog (or in my case, my dog taking me for a walk), Going for a run whilst listening to your favourite running music or an exercise class that inspires you to push yourself. All of these are great ways of combining things that you enjoy to leading a healthier lifestyle. As for me, well I am a naturally competitive person that thrives on that feeling of winning but gets a motivational kick to do better when I loose. Time is always against me so I find 45 minutes of exercise fits well into my lifestyle. I enjoy social interaction so meeting people whilst I exercise is a bonus. So what is this big mystery of fun exercise I hear you say and squash or racketball could be the answer? Squash and racket ball; what’s it all about? Squash and racketball tick all the boxes for my quest to enjoy exercising and gaining a healthier body. Racketball is a fantastic game and perfect for someone who’s never stepped onto a squash court before. (The game is played on the same court as squash). It can be played at any pace and is brilliant for the complete beginner. The rules are very similar to squash, though to make it a little easier for the racket novice. 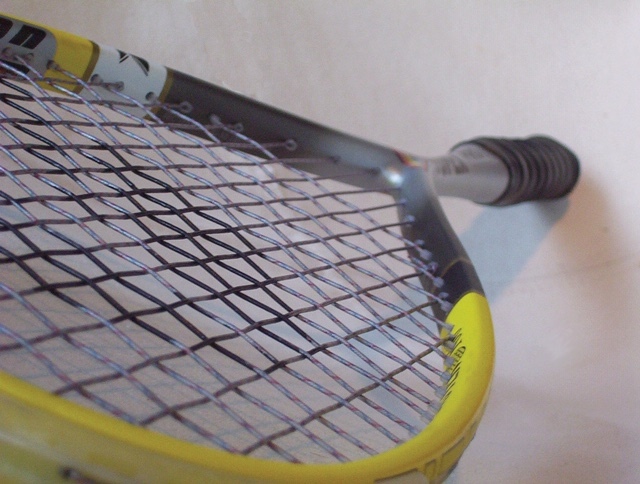 The key differences are the racket head is bigger and the ball is much bigger and bouncier (this lets you get some good rally’s going). Don’t get me wrong, racketball can be highly competitive and energetic at the higher levels. It’s also very enjoyable for beginners, older adults and for developing better hand-eye coordination. Squash can be daunting for beginners, which is why it’s often recommended to try racketball first. Squash can also be played at all levels and there are even different balls (with varying bounce) to use depending on your ability. As in all sports squash is the most fun when you have two people of similar ability. Whether playing regularly with a friend or by playing in a league. This ensures you are put into a division of people at a similar standard to yourself. Chilwell Olympia runs a squash league like this and there are plans to start a similar racketball league soon, depending on interest. Fancy giving racketball a go? Racketball got you interested? Chilwell Olympia is hosting three racketball workshops in April 2019 for beginners. You’ll learn the rules, with lots of top tips and techniques and most importantly it’s an opportunity to give it a go. If you are looking for a new fun way to keep fit, book onto a racketball workshop or enter the squash leagues at Chilwell Olympia. Contact Chilwell Olympia on 0115 917 3333 for further information.